On Monday 23 April 2012, SASNET’s deputy director Lars Eklund visited Kristianstad University in order to meet some of the researchers and staff working on South Asia related collaboration projects. A meeting was kindly organised in the administration building of the university (that actually used to house a military garrison before being turned into an educational institution) by Associate Professor Kerstin Samarasinghe from the School of Health and Society, and Lise-Lotte Nilsson, Director of International Relations, Kristianstad University. Also present at the meeting were Associate Professor Ann-Sofi Rehnstam Holm, and Associate Professor Torvald Olsson from the School of Education and Environment, both of them strongly involved in India related research. The university has had a long-standing collaboration with Sri Lanka, not the least due to Dr. Kerstin Samarasinghe’sefforts over the years. The School of Health and Society has a long tradition of students and teachers exchange with Sri Lanka, and has for 8 years – maximum time allowed – had an exchange programme agreement (through the Linnaeus-Palme exchange programme) with the Open University of Sri Lanka in Colombo. Kerstin has been in charge of this work, that has also led to the signing of an extended MoU (Memorandum of Understanding) between Kristianstad University and the Open University of Sri Lanka. The label ”extended” means that exchange activities are open for all departments in the respective universities. The ambition is to keep the collaboration going even though the Linnaeus Palme programme is over. Kristianstad University has also recently established cooperation through another Linnaeus Palme exchange programme with Sri Jayawardenepura University in Colombo. The collaboration with Sri Lanka got a boost when a high-level delegation from Kristianstad University, led by the Vice Chancellor Lars Carlsson, and Vice Rector Lena Persson, led a delegation to the country in February 2012 (photo to the right). It was a fruitful visit, resulting in collaboration agreements with both Open University (OUSL) and Sri Jayewardenapura University. The agreements make it possible for two students from each university to come to Kristianstad for its Masters programme in Integrative Health every year without having to pay the fees that non-European students normally have to pay for studies at Swedish universities since 2011. The official tour to Sri Lanka also had a specific purpose, namely to ground plans for a new triangular collaborative Masters programme in Geriatric Nursing between Kristianstad University, Open University and Chiang Mai University in Thailand. For this reason, meetings were held on high level with the Ministry of Higher Education, and the University Grants Commission of Sri Lanka. A joint application to launch such a programme has been sent to STINT. 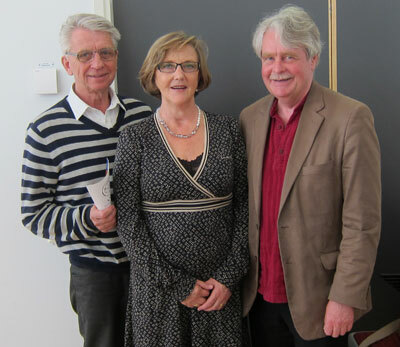 Meeting at Kristianstad University, from left to right: Christer Ohlin, Lena Persson and Lars Eklund. Another purpose with the tour was to support OUSL in its ambitions to launch a Masters programme in Nursing. Professor Anna-Karin Edberg from the School of Health and Society was also part of the Swedish delegation. She has written a report on the tour. Read her report (as a pdf-file). Information about the official tour to Sri Lanka and its outcome was discussed over lunch with Vice Rector Lena Persson, who is also an Associate Professor in Nursing at the School of Health and Society, and Dr. Christer Ohlin, in charge of Special Education at the School of Education and Environment. Dr. Ohlin has previously been engaged in projects in Tanzania, but is now planning for new projects with Sri Lanka. 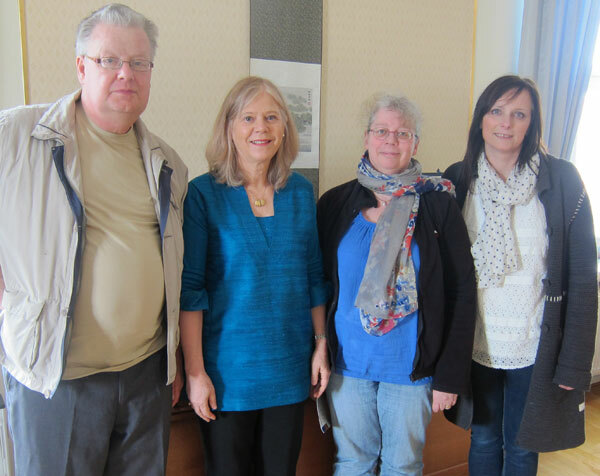 Ann-Sofi Rehnstam-Holm and Torvald Olsson at the School of Education and Environment also informed about their respective research projects, focusing on India. Dr. Ann-Sofi Rehnstam-Holm is a Microbiologist, who since the mid-1990s has been involved in a long-standing and fruitful collaboration with the Karnataka Animal Veterinary and Fisheries Science University in Mangalore on the Indian west coast, focusing on Toxic algae, their ecology, and about methods to develop identification and detection of these algae, along the south-west coast of India. She has visited India a dozen times during the 2000s. Her research currently focuses on marine bacteria, especially Vibrio species that are pathogenic to humans (V. cholerae, V. vulnificus and V. parahaemolyticus). The India projects have been carried out in collaboration with Dr. Anna Godhe at the Department of Biological and Environmental Sciences, University of Gothenburg. The main research partners on the Indian side have been Professor Iddya Karunasagar, and Associate Professor Indrani Karunasagar. The current project is entitled ”Climate induced changes in phytoplankton community structure: The role of harmful algal species in the Arabian Sea”. More information about Ann-Sofi Holm’s research. Dr. Torvald Olsson has been engaged in research on South Indian society, culture, and religion for more than 30 years. Currently, Torvald is involved in a research project entitled ”Health, Gender, and Demography: A Socio-cultural study of Mother and Child Healthcare in two Indian states”. It is a comparative, longitudinal, and phenomenological-ethnological life world analysis project, focusing on the relative and absolute deprivations in health accessibility in the states of Tamil Nadu and Bihar. It has been funded by a grant from Sida’s Developing Country Research Council (U-landsforskningsrådet) in 2006 and will be competed during 2012. The project is carried out in collaboration with Dr. Shahid Perwez from the University of Edinburgh, Scotland. More information about Torvald Olsson’s research.